A perfect summer day on Bailey Island — beginning with wild Maine blueberries for breakfast, a visit to the Brunswick Farmers Market to stock up, an easy-going bike ride to the furthest end of the island where we nibbled on wild radish blossoms and seed pods, a walk around the Giant Stairs to see the basalt formations, and ending with a memorably delicious dinner at Tao Yuan Restaurant. August is here, dear friends, enjoy every minute of it. 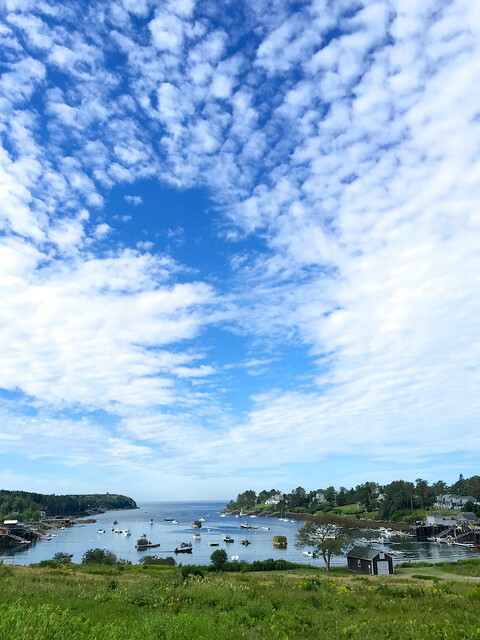 Above: Mackerel Cove at Bailey Island, Maine. This entry was posted in field trip, interlude, local food and tagged farmers' markets, maine, restaurants. Bookmark the permalink. Ah, August. I usually hate it, the heat and humidity part. But this foggy Sunday morning I am enjoying coffee on my back deck, 65 degrees, perfect for me, admiring my vegetable garden, with hanging baskets of flowers for the bees and butterflies, and hummingbird feeders being visited by squabbling Allen’s hummingbirds. Pure paradise. Summer in coastal Maine is short but so sweet. Wish we were there to experience it. I have a craving right now for wild blueberry pie. We have a week in Acadia booked for mid-September, to coincide with the MDI garlic festival. Thanks for alerting me to the MDI garlic festival, how fun!